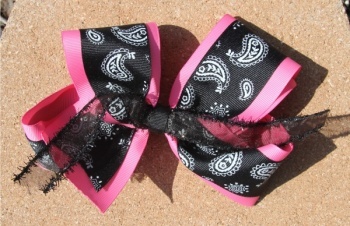 This is a double lined bow that has a black see through ribbon running through the middle. The bottom layer is a 2.25" wide grosgrain hot pink ribbon that has 1.5" black with white paisley designs all over it. The two layers are wrapped with a 3/8" black grosgrain ribbon and it is attached to a French clip. This is a stylish looking bow!